Dave and Alex are not even half as competitive as I used to be when I was their age. Some of my friends say I still am. It's something I've been trying to correct for many years. But it's not easy: growing up I was encouraged to always be the best at sports and school. Always competing against others, never as a way to better myself. In the small town where I used to spend the summers as a kid there was a festival in which swimming and bicycle races were held, and a drawing competition. I was very good at swimming and came in first year after year, collecting trophies which one day, many years later, I had the sanity to look at as what they really were: junk. Thirty years ago there were loads of kids at the games and races. In the drawing competition there were dozens. I used to love drawing too, but I never won anything, not even third prize. I tried very hard to draw what was expected of me, but it was never good enough. I remember listening for the announcement of the winners in great anticipation and then, suddenly, the disappointment at not being one of them. Urged by their cousin, Dave and Alex asked me a couple of weeks ago to take them to the drawing competition. Dave has always loved drawing. Alex is not so keen on it, but my niece promised him he would be given lollies as a prize, so they were both persuaded, and we went. At least two decades had gone by since I was there last, and it felt strange. Everything looked so much smaller than I remembered it. Some of the organisers of the games were still the same, and they recognised me, after all these years and all the kids there used to be. Nowadays, there are not as many. For the drawing competition, there wasn't even a dozen. As I expected, Alex did his drawing in less than ten minutes. A three-year old finished his in a record time of five minutes, and as soon as that happened, he was given a bag of lollies. That's when Alex announced he was done too. But Dave and Mar, who also loves drawing, took a long time. Mar gets first prize in her age category every single year, and this year did again, as I'm sure she knew she would. While watching Dave I wondered what his motive was to keep drawing as intently as he was. He had already seen there would be lollies for everyone. Was he thinking about winning like Mar was? I could not believe it. He has never cared much about winning or losing. He's the sort of kid who lets his younger brother win at card games so that he won't get upset. No, I soon realised Dave was drawing for the mere pleasure of drawing, totally engrossed in what he was doing. He didn't look at other kids' drawings like I would have done to make sure mine was better. Mar and Dave were two of the last kids to finish. Dave handed his drawing to me and before I gave it to the organisers, I asked him questions about it, like I always do, refraining from evaluating it as good or bad. He told me about it. It was full of colour and animals, there was an eagle and a monkey, a volcano with lava and a waterfall. Needless to say, I loved it. It showed so much imagination and creativity. I have always wondered where it comes from. I never told Dave how to draw, or write, for that matter. It just happened. When he was very young, like 2 or 3, he used to ask me to draw to him all the time. And so had done my niece Mar. Alex did as well but not as much. So for a few years I drew lots of perfect moons and suns, which were what they used to ask for more. But I never told them how to do it. Dave in particular watched what I did and then one day started drawing and blowing my mind away. The results of the competition were given in the evening of the same day. As I expected, neither Dave or Alex couldn't care less about being winners or not. 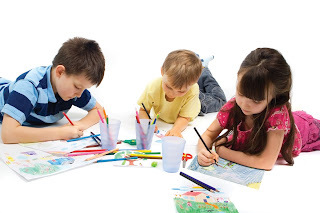 Alex had already eaten all his lollies and Dave had already enjoyed drawing. They didn't get what all the excitement was about. So I told them what was going to happen: the lady with the microphone would call their names and they would have to go up the steps to the platform and pick up their prize. They both shied away at the thought of going up there alone and with all those people watching. They asked me to go with them and I did. Alex was given third prize in his age category. Mar made a big fuss over it. Alex didn't even look at his diploma. He didn't proudly show it to his grandparents when we got home. That piece of paper had absolutely no meaning to him. Neither to me, I must say. I should also say that there were exactly three participants in his age group. Dave was given second prize in his age group. Again Mar congratulated him profusely and he looked at her in bewilderment. The number of participants in his group was two. I looked at the two drawings and my first thought was, are you kidding me? The other drawing belonged to a boy who had dutifully written his name and age (6) in perfect cursive over a perfectly drawn house. What is so special about this drawing?, I wanted to ask the judges. It's just like thousands of other boring houses children are told to draw every day! I felt a pang of hurt on my son's behalf, a familiar feeling coming back from my childhood. But I didn't show it, of course, I'm not that sort of mum! It was my competitive little demon poking out his head again. Dave was not fazed at all. Mar made it sound as if he had won second prize from among hundreds of kids. He just shrugged his shoulders. When we got home I asked him what he wanted to do with his certificate. He said, 'It's just a stupid piece of paper, not a drawing.' I couldn't agree more. It wasn't even beautiful, but I must say it was ironically funny: the judges signed their names as Picasso, Velázquez and Van Gogh. I must admit, I'm proud of myself. When things like this happen I feel like I'm doing something right, I'm breaking a cycle. My son draws because he loves it. Not to please the teacher. Not to please me. Not to get any prize. Just because he LOVES it.